Capillarity - or capillary action - is the ability of a narrow tube to draw a liquid upwards against the force of gravity. Surface tension is typically measured in dynes/cm or N/m. Capillarity, like surface tension, decreases with increasing temperature. The temperature variation, however, is small and insignificant in most problems. Engineering ToolBox, (2005). Capillarity. 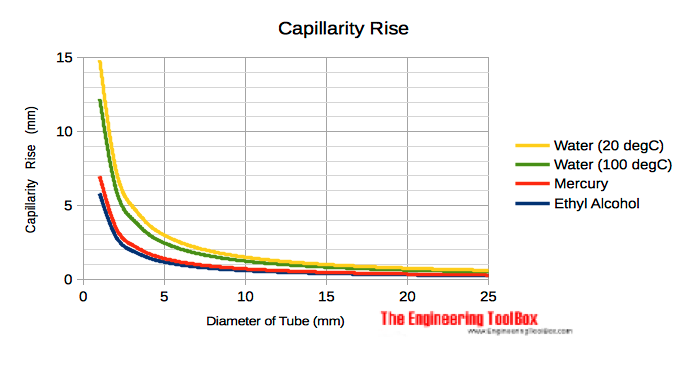 [online] Available at: https://www.engineeringtoolbox.com/capillarity-d_961.html [Accessed Day Mo. Year].